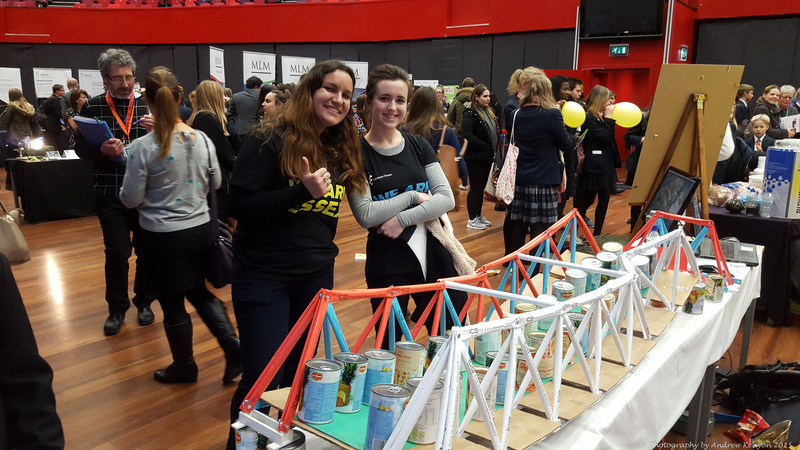 Yesterday I was at University of Essex in Colchester supporting the local Big Bang fair representing the Institution of Civil Engineers. The event was more careers fair than the big STEM event of last year but over four sessions I still got to speak to many many yr 9 and 10 students many of who were genuinely interested in the industry. It was also very pleasing that a significant number of those who came to our stand – possibly as many as 50% – were girls. I was there with others to promote Civil Engineering as a career and to highlight the work I do as a professional civil engineer for my employer Taylor Woodrow (A division of Vinci). With their support I had prepared a paper bridge activity / demonstration which I was going to be working on during the event. 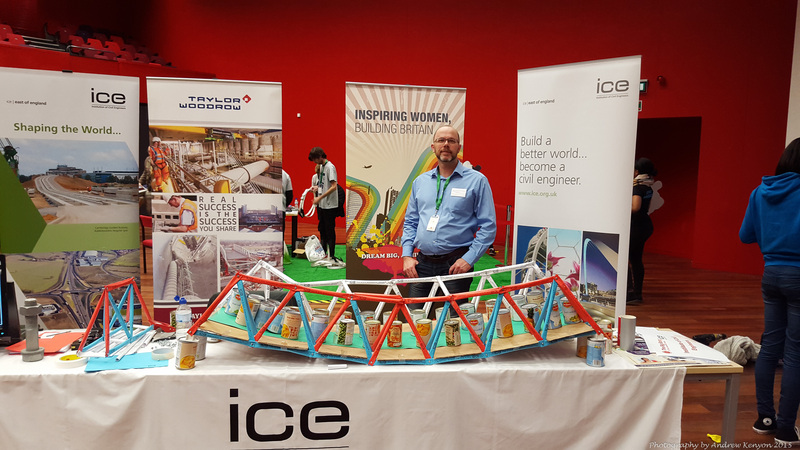 I was to be sharing the work on the ICE stand with two other civil engineers – Glen Owen who is the Regional Director of ICE East of England region and Michelle Nixon the ICE Essex Branch Schools Liaison Officer. Things didn’t pan out as planned however as Michelle was only able to be there for a couple of hours due to an unexpected home issue and Glen didn’t make it at all as he was struck down with a stomach bug. So I was there early and set up with plenty of time which I made the most of to try and get some of my paper bridge built as I suspected that I wouldn’t have much time to do so once the students started coming in. Our stand before the students arrived. 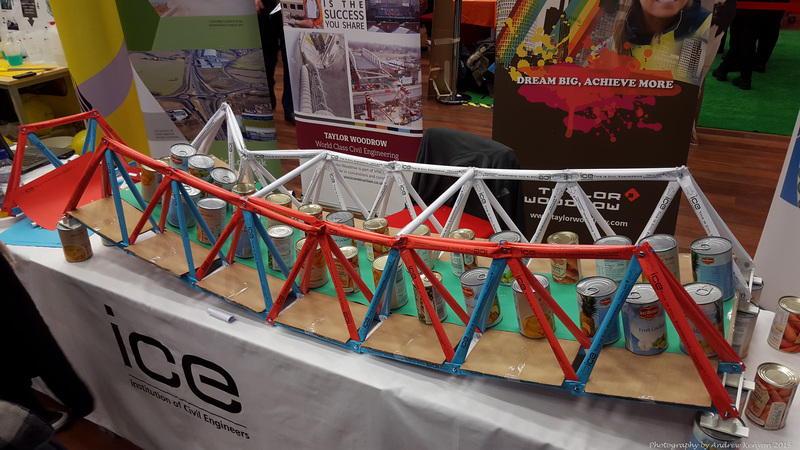 The small coloured section of truss was used constantly throughout the day to talk about tension and compression and bending and trusses and beams and just about everything else! Old Oak Common 4D visualisation playing on a loop on the screen too which prompted much discussion on digital engineering. We had four 45 minute sessions where groups from a number of local schools spent time in the hall visiting the various stands and talking to those manning them. These were great sessions we had a lot of interest from students and teachers and also from Uni student ambassadors/helpers. This was helped by me building my bridge which attracted some who just came to enquire what I was doing. Most of the students were interested in civil engineering as a career and all seemed to be interested in learning about the range of work that civil engineers do. It was great to open their eyes to all the things they take for granted every day like electricity and water and sewage disposal and the role civil engineers having in providing the infrastructure for these and most other aspects of our day to day lives. Most the the students when first asked where electricity comes from to charge their iphones said the socket in the wall! While talking to the students and drinking and trying to eat I tried desperately to assemble the paper bridge in time which included having to make some of the members. The bridge consisted of two tubular trusses about 2m long made with tubes of rolled up A4 paper with cardboard ‘deck plates’ between them. The tubes were connected with 5mm bolts and were colour coded (on one truss) red for compression members and blue for tension (hope I got them all correct!). One highlight of the morning was the launch of the Soyuz rocket with Tim Peake aboard which was shown live on an enormous screen. This prompted much discussion on rockets and the ISS and the role civil engineers played in that and in everything else in life. 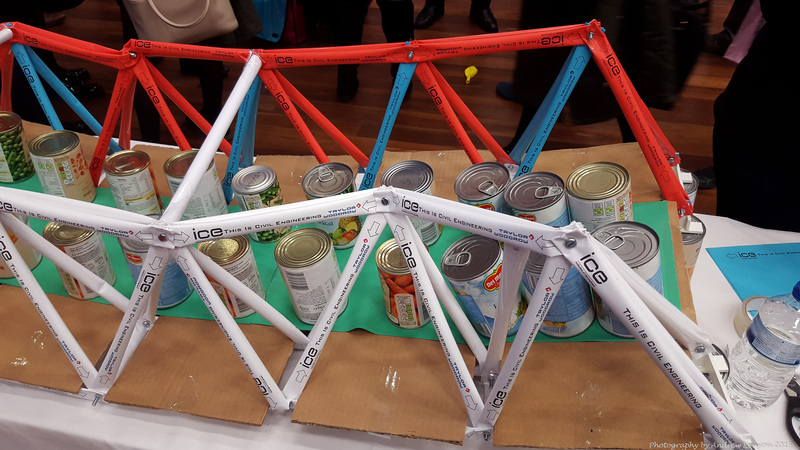 I managed to finish the bridge with a little help from some of the students in the last schools session of the day and (without checking it over) we set up for load testing it. This we were doing with tins of fruit and veg which we had brought for the purpose of (60 of them). The tins were paid for by Taylor Woodrow and will go to a food bank afterwards. One man and his bridge. Look carefully at the top node on the back (white) truss at the left hand end. One member is not attached 😦 The use of coloured paper for the compression and tension members was an inspired idea and worked really well when talking to the students. The completed bridge was finally finished half way through the 4th session and was rather hastily completed. 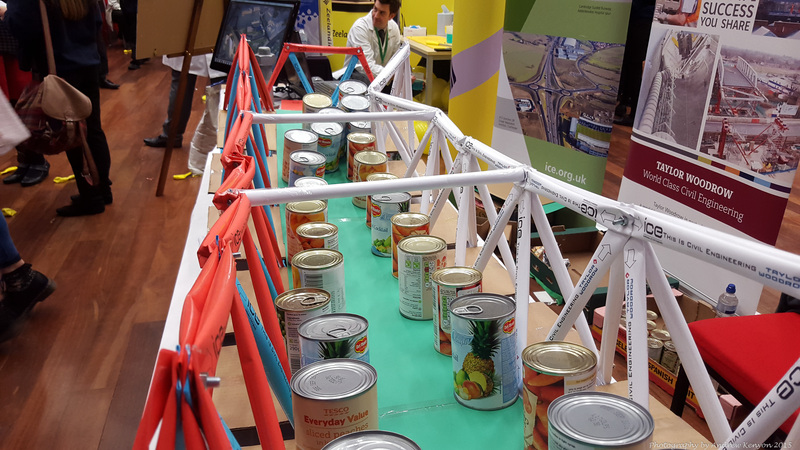 Unfortunately I had nothing to raise the bridge off the table so it had to be balanced on 8 tins of fruit – not that common a support arrangement for bridges in our industry. With the help of two uni students we carefully and evenly loaded up the bridge until it (prematurely) failed. It took less than I had hoped and failed in some interesting ways that allowed some interesting discussions with the students about how and why it failed. One reason was a single tension member that had not been secured in our haste and the lack of a pre-loading check and ‘permit to load’ ultimately led to its downfall. One of the points I made to many of the students when looking at the collapsed bridge was that we learned a great deal from failure – and probably far more than we do from success. Failure is often a good thing and makes us stronger. People should not be afraid to fail. A somewhat failed bridge. But even failed it was a sight to behold and a great discussion topic. It failed mainly from lateral failure of the white truss left end – partly due to unsecured member but partly due to lack of cross ties which I only had time to install two of. The other main failure mode was failure of the top boom nodes mainly on the coloured paper truss on the top compression members. Two of my Uni student helpers who were both studying non-engineering subjects. Romanian student on left studying world politics and the other studying computer science. Both were really helpful and really interested in the bridge and what I was saying. The computing student to the extent she was asking about roles for computer specialists in construction companies! The offending failed white truss. Note the un-attached tension member that I think allowed the top node to move. The addition of cross props would have helped it stay standing for longer. If there isn’t a better example of why a ‘permit to load’ is needed then I don’t know what is! Failed compression chord node. I knew this would fail like this and it is a design flaw in paper bridges of this type. Cross props with stiff end connections to the node would have stopped it rotating and would have increased the failure load. View looking down the bridge. 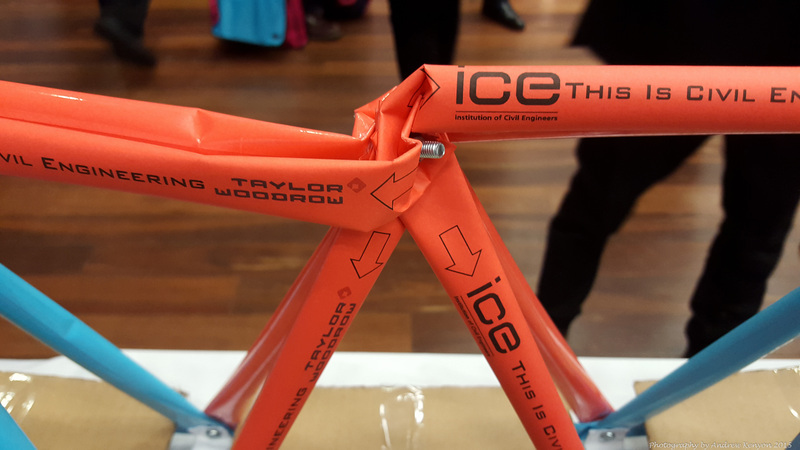 The compression failure of the joints on the coloured truss is very evident. Final view of our stand and the collapsed bridge. Just before I folded it up and stuffed it in the car! A great day was had. A lot of effort in the planning and execution – but much enjoyed by me and the students (I think).